"It's the Triassic period. After millions of years of evolution, the conditions are right for something new, something different: the dinosaurs." When I was a kid I was pretty fascinated with dinosaurs. Of course, most male children have power complexes that draw them toward huge, powerful, emotionless, efficient killing machines, so my personal intrigue is not too surprising. I think my interest reached a peak when Jurassic Park was released. I saw that movie several times, and in doing so exorcised my need to see gigantic lizards tearing things to shreds, causing general havoc, and spawning several bad sequels. Since then, any dinosaur-related media product hasn't really piqued my curiosity, and When Dinosaurs Roamed America is no exception. When Dinosaurs Roamed America tries to be one of those wildlife documentaries that people watch when they have absolutely nothing better to do, but its subjects have been dead for more years than it takes Peter Gabriel to release a new album. The answer in the past to this problem has either been to use cell animation or clay animation. But this is a new millennium, and now the obvious answer is computer animation. The only trouble with computer animation is that a lot of it looks bad. Even a lot of the staff at ILM can't create really good CGI. At least with cell animation or clay animation the audience realizes that the dinosaurs will look somewhat stylized due to the nature of the medium, but with computer animation, people expect things to look realistic. And these dinosaurs don't. They walk awkwardly, the noises they make sound metallic and artificial, and I've never seen a creature with such sharp teeth and powerful jaws bite at a carcass and bring up so little flesh. Still, the show isn't all bad. For example, John Goodman narrates it. His presence alone saves the whole enterprise. Most people don't know it, but John Goodman is actually worshipped as a demigod in certain underground cult circles (not that I would know anything about it). And not only that, but once you get past the fact that the dinosaurs look really fake, and don't correctly interact with their environment (which was really filmed, and the dinosaurs were superimposed on it), you can sit and enjoy their "life and death struggles" in a superficial sort of way. And the scenery is nice. Plus, there are certain points where the action stops and John Goodman explains the way certain dinosaurs are built. That is, the dinosaur's skin disappears and we see their skeleton, and Goodman explain how a certain muscle or tail structure helps their speed or balance. This is fairly interesting. In the end, I think the question to ask is the following: Would you rather sit and watch a show that gives you elementary information about dinosaurs in a low-quality fashion, or would you rather watch Jurassic Park, which may have flaws, but at least has suspense and sometimes believable special effects? Even the John Goodman factor can't get anyone but the most hysterically obsessed dinosaur nut to see When Dinosaurs Roamed America. Image Transfer Review: When Dinosaurs Roamed America is presented in an anamorphic transfer that has no obvious flaws. The locations look beautiful, with vivid colors, and I saw no artifacting. The only problem with the transfer is that it may be so good that the poor quality of the animation becomes even more evident than it did when first aired on television. Still, I can't grade a transfer down for being too clear. By the way, the packaging says the aspect ratio is 2.35:1, but it's obviously 1.77:1. Audio Transfer Review: This 5.1 mix is not too bad. It's fairly directional, with active surrounds all the way through. Ambient effects are used to create a lively soundfield that envelops you and is engaging to listen to, probably more so than the show is to watch. My one problem is a lack of bass. I had my subwoofer turned all the way up, and I still didn't feel as much as a nudge when a particularly large dinosaur roared or even walked. You'd think a show about dinosaurs would make great use of bass, but not so in this case. Extras Review: There are several extras on this disc, and they're all inane to one degree or another. There are two behind-the-scenes featurettes, which run about two-and-a-half minutes each. Some people say it's amazing how much information can be relayed in a minute. After seeing these featurettes, I'm amazed at how little information and how much promotion can be relayed in two-and-a-half minutes. Next is a "music video," which is actually a montage of behind-the-scenes footage set to music. Note that the two featurettes and video use much of the same footage. There is an interview with the animation director, and an interview with a paleontologist. They both manage to say a little. There's a section of dinosaur facts, and then a dinosaur quiz. There are dinosaur graphics, which are just all the various dinosaurs walking around in circles. There's biographies of various scientists, and also a biography of the man who did the musical score. Oh, and let's not forget my favorite extra, entitled "Discovery.com." This extra takes you to a page on the DVD that says, and I'm paraphrasing, "Visit discovery.com!" You'd think that people would get it just from having a section of the menu say "discovery.com," but apparently not. While there are several extras, their complete lack of substance makes me grade this section harshly. 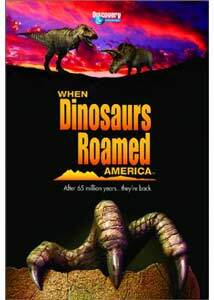 Lightly entertaining, When Dinosaurs Roamed America doesn't have animation or information good enough to attract any viewers. While not an utter disappointment, it's still nothing special.